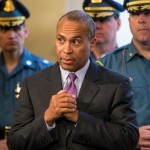 David is joined by Massachusetts Governor Deval Patrick to chat on the first anniversary of the Boston Marathon bombing. This conversation took place on April 22, the day after the 2014 Boston Marathon. Patrick talks about his memories of the 2013 bombing and the steps the city and state took to ensure the safety of all runners and spectators in 2014.